3 How Do You Store Fresh Dates? 4 How Much Fiber Is in Fresh Figs? If you're looking for a sweet snack that is low in fat, grab three or four dates. These fruits also make a great addition to salads, desserts and savory meat dishes. 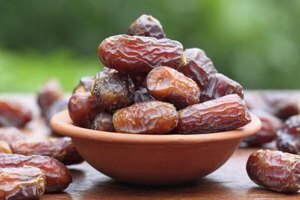 Dates are a fleshy dry fruit that is commonly eaten in desert climates because it is packed with many of the essential nutrients for a daily balanced diet. However, take into account that all varieties of dates are calorie-dense and high in sugar; limit how many you eat per day. All varieties of dates contain high amounts of carbohydrates, particularly when they are at their ripest stage. One 24-gram medjool date contains almost 16 grams of sugar. Dates contain both glucose and fructose. Fructose is twice as sweet as glucose, giving dates their familiar sugary taste. Dates are a rich source of dietary fiber, which is important for healthy digestion and cholesterol levels. Most adults need 21 to 38 grams of fiber every day. The amount of fiber in dates decreases according to the ripeness of the date; fully ripe, soft dates are the sweetest and have the least fiber. 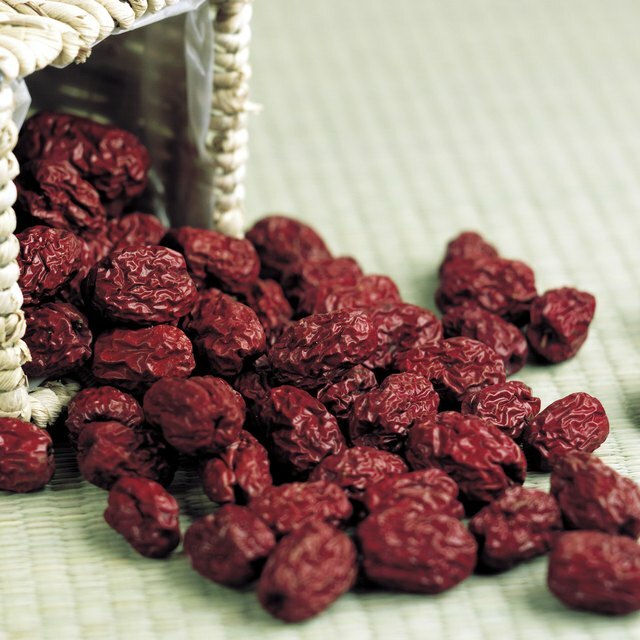 One 24-gram medjool date contains 1.6 grams of fiber. Dates contain a large number of calories packed into a small bundle, making this energy-dense food a good alternative to an energy or snack bar. Just one 24-gram medjool date contains 66 calories, and a snack of four dates provides 264 calories. Dates are higher in protein than the equivalent amounts of other common fruits. A 100-gram serving of four medjool dates provides 1.8 grams of protein, while the same amount of raw apple with skin gives you 0.3 gram of protein. Additionally, dates contain almost no fat. The essential nutrient potassium helps balance your blood pressure and keeps your heartbeat steady. A serving of four medjool dates gives you 696 milligrams of potassium, which is about 15 percent of the daily recommended intake. Other minerals found in dates include calcium, iron, magnesium, phosphorus and zinc. You can also get smaller amounts of vitamins A, K, B-6 and D by snacking on dates.